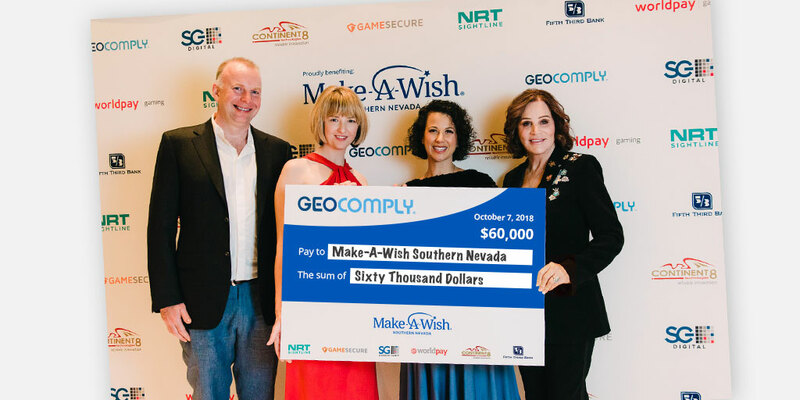 October 8, 2018 (Las Vegas, NV) – GeoComply is pleased to announce that they have raised $60K for Make-A-Wish Southern Nevada from a gaming industry event on Sunday evening, prior to the annual G2E conference in Las Vegas. The event was hosted at the residence of the well-respected philanthropist Diana Bennett and included gaming industry executives from around the world. The funds were raised by GeoComply’s partners (Worldpay Gaming, SG Digital, Sightline Payments, Fifth Third Bank and GameSecure) as well as through individual donations from guests at the event. GeoComply is a global leader in geolocation technology. Since launching in 2011, GeoComply has quickly become the iGaming industry’s trusted solution for reliable, secure, and accurate geolocation services. GeoComply currently supports regulated online casino, poker, sports betting, lottery, ADW, and DFS operators in 42 US states to ensure compliance with state and federal regulations. For more information, please visit GeoComply.com. Make-A-Wish grants life-changing wishes for children with critical illnesses. According to a 2011 U.S. study of wish impact, most health professionals surveyed believe a wish-come-true has positive impacts on the health of children. Kids say wishes give them renewed strength to fight their illness, and their parents say these experiences help strengthen the entire family. Make-A-Wish Southern Nevada is part of one of the world’s leading children’s charities, serving children living in Clark, Nye, Lincoln and Esmeralda Counties. With the help of generous donors and more than 400 volunteers, Make-A-Wish Southern Nevada has granted more than 1900 wishes since its inception in 1996. Visit Make-A-Wish at snv.wish.org.